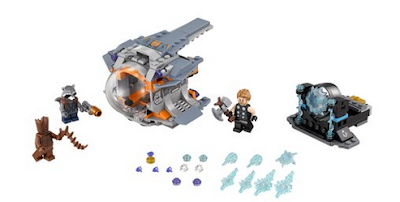 Amazon has the LEGO Super Heroes Marvel Thor's Weapon Quest on sale for $12.99 (regularly $19.99). Join Thor, Rocket and Groot on a thrilling Avengers mission with LEGO Marvel Super Heroes Thor's Weapon Quest. This super hero toy features an Escape Pod with an opening cockpit for 3 mini figures and 2 stud shooters, plus a space station with a cosmic power source, weapon and features, the Infinity Stone element and stand, and 10 Power Burst elements.